Day 1: Board your transatlantic flight. Day 2: Arrive Rome/Maiori: Check into your hotel in Maiori on the Amalfi Coast. A welcome dinner is included. 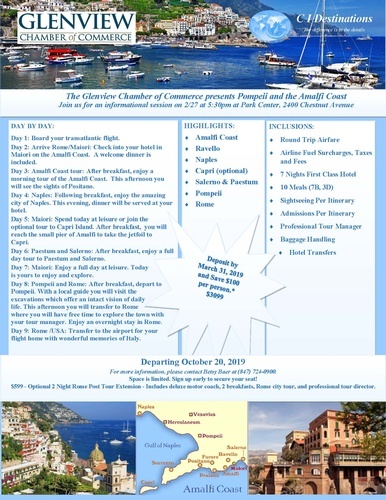 Day 3: Amalfi Coast tour: After breakfast, enjoy a morning tour of the Amalfi Coast. This afternoon you will see the sights of Positano. Day 4: Naples: Following breakfast, enjoy the amazing city of Naples. This evening, dinner will be served at your hotel. Day 5: Maiori: Spend today at leisure or join the optional tour to Capri Island. After breakfast, you will reach the small pier of Amalfi to take the jetfoil to Capri. Day 6: Paestum and Salerno: After breakfast, enjoy a full day tour to Paestum and Salerno. Day 7: Maiori: Enjoy a full day at leisure. Today is yours to enjoy and explore. Day 8: Pompeii and Rome: After breakfast, depart to Pompeii. With a local guide you will visit the excavations which offer an intact vision of daily life. This afternoon you will transfer to Rome where you will have free time to explore the town with your tour manager. Enjoy an overnight stay in Rome. Day 9: Rome /USA: Transfer to the airport for your flight home with wonderful memories of Italy. For more information, please contact Betsy Baer at (847) 724-0900. Space is limited. Sign up early to secure your seat! $599 - Optional 2 Night Rome Post Tour Extension - Includes deluxe motor coach, 2 breakfasts, Rome city tour, and professional tour director.